It’s December. The leaves have fallen, the days are shorter and, much to the dismay of your acoustic guitars, the air is crisp. That’s right, your guitars hate the fall and winter. Why? They can die of thirst. Your acoustic guitar needs about 45% to 55% relative humidity to remain healthy and free from potential harm. Fall and winter weather here in Maryland brings drier air. To make matters worse, the heat from our furnaces sap the most of the remaining moisture out of the air. Unless you have a household humidification system, chances are the humidity levels inside your home will drop to below 20% during the fall and winter months. So, what happens when your guitar dries out? Wood is an organic material that needs to be hydrated. When it dries out, it shrinks and becomes brittle and prone to cracking. 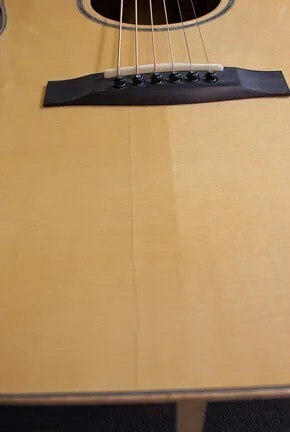 Repairing a cracked guitar is a complicated and expensive process that rarely brings the guitar back to its original condition. Install a hydrometer (a device that measures relative humidity) in your guitar room. When it consistently drops below 45%, it is time to take action. When that time comes, buy an Oasis or D’Addario guitar humidifier and use as directed. Each of these products releases moisture into the air in a manner that is safe for the guitar. The guitar will happily drink the moisture that is released. Keep your acoustic guitar along with its humidifier in the guitar’s case. The humidifier works much more efficiently in the enclosed space of the guitar case than it does sitting on a stand. When you are playing the guitar, keep the lid closed on the guitar case. That will help keep the humid air in the case from escaping. If you suspect your guitar is severely dehydrated, consider bringing it into the bathroom with you as you shower for a week. The steam from the shower will help rehydrate the guitar. Immediately return the guitar to the case after your shower. When spring/early summer rolls around, start monitoring the hydrometer. When it consistently reads humidity levels above 45%, you can release the guitar from its prison and keep it on a stand for the rest of the summer.